Appealing chart of Barnstable Harbor in Cape Cod, Massachusetts. An uncommon and highly appealing U.S. Coast Survey nautical chart or maritime map of Barnstable Harbor, Cape Cod, Massachusetts. 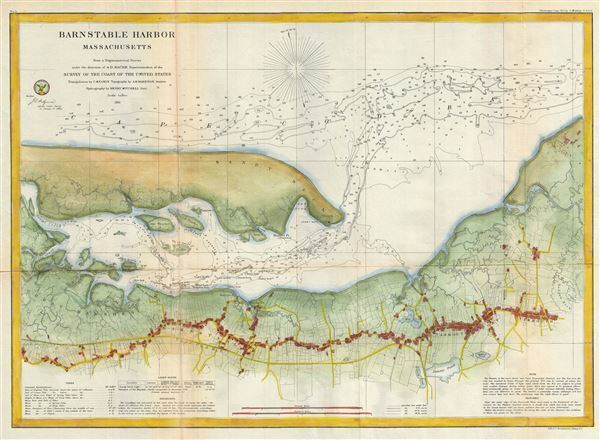 The map covers from Great Creak and Sandy Neck south to the Cape Cod Railroad and Dennis Pond in Yarmouth. Covers the cities of Barnstable, Yarmouth Port, and Yarmouth, with detail to the level of individual buildings and land plots. The map offers a wealth of maritime detail including countless depth soundings, identification of various rocks, shoals, and other undersea dangers, and notes on tides, lighthouses, soundings, and sailing instructions. The triangulation for this chart was completed by C. M. Eaken. The topography is the work of Am M. Harrison. The hydrography is the work of Henry Mitchell. The whole was compiled under the direction of A. D. Bache, Superintendent of the Survey of the Coast of the United States and one of the most influential American cartographers of the 19th century. Published in the 1861 edition of the U.S. Coast Survey Superintendent's Report.